Highly likely to recommend We interviewed several. local real estate agents when we wanted to sell our mountain village condo. We were impressed with Adam's ideas of marketing our property and listing it at a price range that met our desires and the market. He did a great job marketing the property and brought us several offers. We highly recommend Adam. He works very hard and effectively. Highly likely to recommend We interviewed several. local real estate agents when we wanted to sell our mountain village condo. 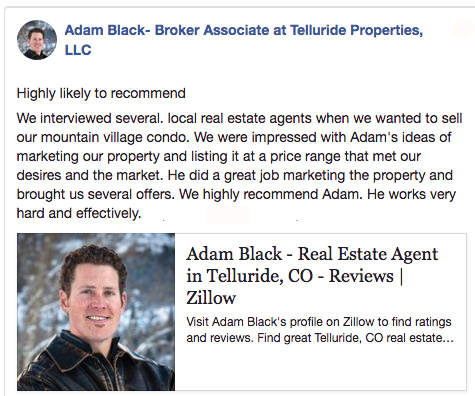 We were impressed with Adam’s ideas of marketing our property and listing it at a price range that met our desires and the market. He did a great job marketing the property and brought us several offers. We highly recommend Adam. He works very hard and effectively.